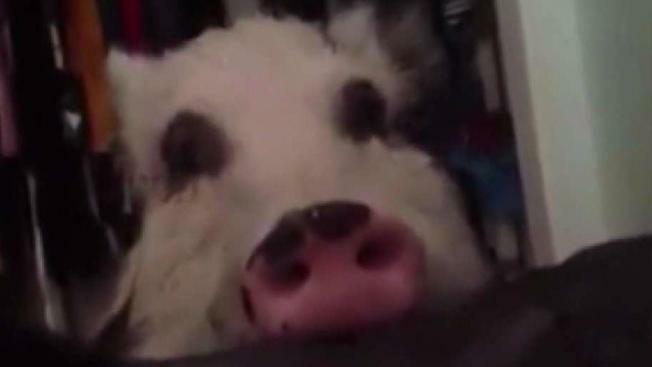 The search is on for a 100-pound pig reportedly stolen in San Jose. The animal's owners, Mark and Jeannie Ackerman, says someone stopped at their house at Ocala Avenue and White Road and took the female pig from the backyard. In addition, the kennel for the pig is missing and surveillance cameras were ripped off from the front of the home. Mark Ackerman posted the alleged incident in a Sunday evening Facebook post, including videos and pictures of the missing pig named "Pig Pig." "She is definitely a member of our family," Jeannie Ackerman said. "We've had her since she was two months old." The owners said this is the second time the 3-year-old pig has been stolen. Ackerman said Pig Pig was stolen two years ago and was later found after someone dumped her at Emma Prusch Farm Park in San Jose. Mark and Jeannie Ackerman have been posting fliers around their neighborhood in hopes of finding Pig Pig. "With this heat my big concern is that she is cared for properly," Jeannie Ackerman said. A police report has been filed and the Ackermans are offering a $500 reward. Anyone with information is asked to contact Ackerman at 408-679-5832.